This wide-angle image shows the fan-shaped shadow cast by the Moon in the sky, which was much broader than the shadow seen during the 2002 total solar eclipse. The shadow was moving from the left (east) side of the image to the right (west). 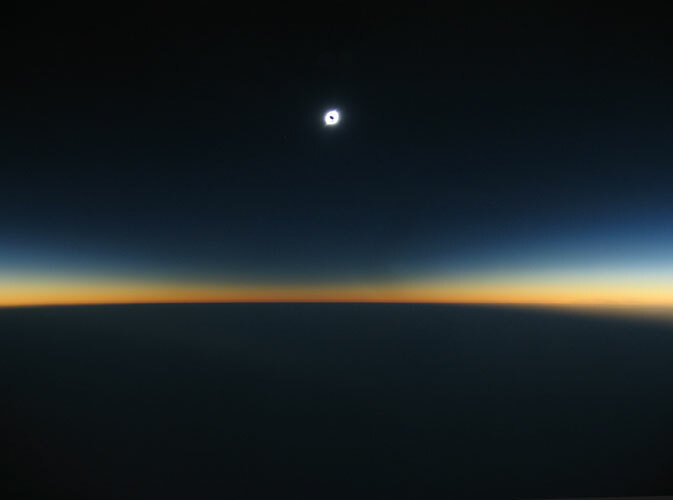 The shadow is somewhat asymmetrical in this image as it was taken before the midpoint of totality, so that the western horizon is brighter. The right portion of the image also shows a portion of Antarctica that is still being illuminated by the Sun, where the Moon's shadow has not yet reached and totality has not yet begun.